This new segment features different Dragon Ball Z characters and we pair a track that reflects the characters storyline and personality. The inaugural segment we feature everything from Trap, Future Bass, Downtempo, Lofi, and much more. You can even take a quiz to find out which character is most like you if you don't have a favorite yet. Goku: Goku is a sweet-natured, pure-hearted warrior with an almost child-like innocence. Throughout their battles, Goku never seems to change much, though he does gain a certain wiser perspective as he gets older. (Of course, he acts like a kid when he's around Vegeta. And Vegeta does the same.) With his heart as his guide, Goku is always willing to sacrifice everything for his friends and loved ones. He always manages to come out on top with the help of his friends. Goku is always celebrating and eating tons of of food with his friends and family when not battling. "Party Everyday" by 2DEEP shows the playful nature of Goku, but at an instance can get aggressive. At points the song sounds like Goku firing off Ki Blasts. Piccolo: Piccolo is the offspring of Piccolo Diamau. Namekians are unisexual (no male or female, they're all just "one type") so Piccolo wasn't exactly 'born', but rather he was spit out and hatched. While his "father" was pure evil, Piccolo was actually a very prideful being who simply hated Goku for killing his predecessor. Because he was born to kill Goku, that was simply what he did. Piccolo ends up re-combining with Kami in order to become a 'super namekian' and reach a higher level of potential in his fighting strength. Piccolo is much reserved, but extremely proud and cautious. The song "Baile De Favela" is like Piccolo with aggressive strength and pride for the people and places their from. This JSTJR remix is Piccolo combining with Kami and reaching its Super Namekian form. Vegeta: He has an incredibly strong pride, and feels that since he is the one of pure blood, and he should be the most powerful in the universe and should be the only one capable of becoming a legendary super saiyan. He starts out as a villain, but ends up developing into the most complex character in the entire series. His father, his world, and all of his people were destroyed by Freezer - yet while knowing this, he still served under Freezer, and did his bidding. 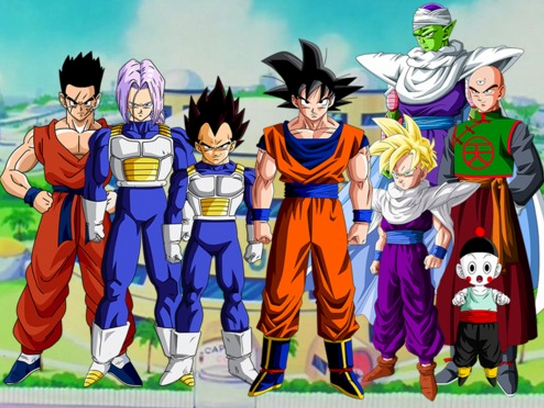 Vegeta becomes Goku's best friend and becomes a loving father to both Future Trunks, and small Trunks. Vegeta Loves his mamacita Bulma, and the track by GTA "Mamacita" is a good representation of the pride, confidence, and swag Vegeta contains within himself. Bardock: Bardock is the father of Raditz and Kakarot (Goku). He is a low-class Saiyan warrior (with a estimated power level of 10000) who leads a team under the command of Frieza. Bardock has immense Saiyan pride and loves his family and friends. He knows that his son will avenge his people and takes immense pride on his death that revenge will be achieved. Seeing your death, past your life, and your sons success must be very strange and eerie, even for a Saiyan. Hex Cougar delivers a good representation of Bardock's powers and creates an aggressive but adventurous harmony similar to the personality of Bardock. Gohan: Gohan is shy, strong, and a fierce Saiyan. He has a secret identity to fight crime and even trained with some of the greatest warriors the galaxy has ever seen. Gohan is a scholar and a gentleman and prefers diplomacy over fighting. He is strong, but quiet. More mellow and relaxed then his relatives and friends. "Bassship" delivers the perfect vibe of Gohan with bass and precise kicks. A smooth melody that gives the warmth of Gohan.